But when I transitioned to clean shampoos, I was disappointed to find I had to sacrifice texture and lather ability (I’m looking at you Rahua Shampoo). Yet, the trade offs were worth it. My hair started to grow back and thicken with regular use of Rahua Shampoo, so I forgave these experiential shortcomings. In just the past two years, things have changed drastically in the green shampoo arena. Now, many brands are utilizing coconut or sugar derived surfactants, like Sodium Methyl Cocoyl Taurate1, Sodium Lauroyl Methyl Isethionate, Sodium Laurylglucosides Hydroxypropylsulfonate, that are nontoxic, safe to use and provide intense foaming capabilities. I’ve been on a rampage testing out various nontoxic green shampoo products looking for ones that offer the best shampoo experience. Read on below for the best green shampoos I reviewed. What it is: A non-foaming shampoo made with organic fair trade African Black Soap, vitamin infused water, and hydrating oils (argan, hemp, coconut, apricot, grapeseed). Herbal extracts – rosemary, thyme, sage, and oregano – give it a very light, refreshing scent. 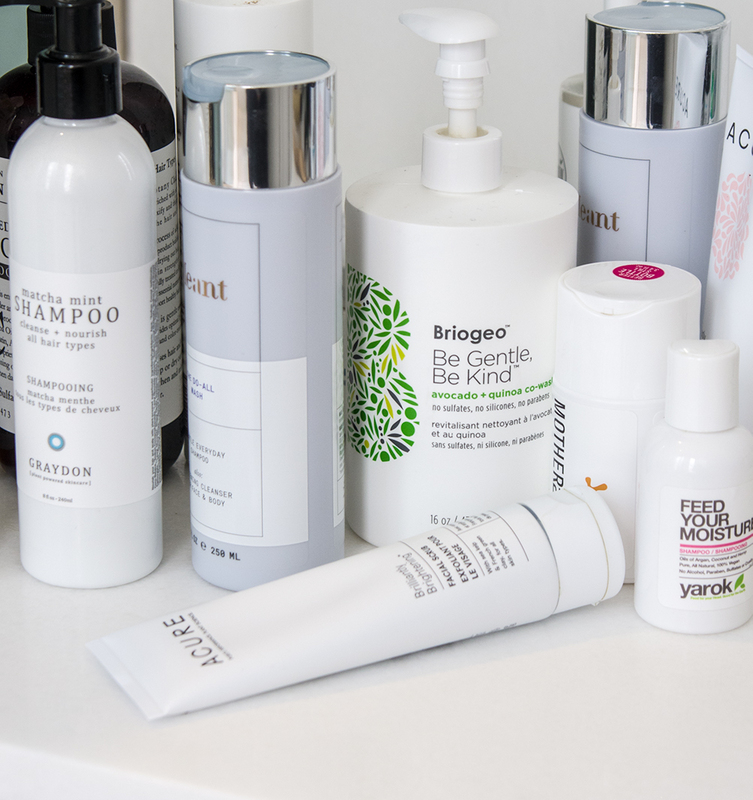 How to use it: Apply a generous amount throughout hair, rinse and repeat. Be sure to apply twice. Review: This shampoo is meant to be followed by a conditioner, but I opted to skip conditioner and found I didn’t need it because this shampoo is so hydrating. Again, it’s difficult to tell if you’ve adequately worked the product through your hair (especially if you have long or thick hair) since it’s non-foaming so you end up using a lot of it, but once dried, this shampoo gave my hair a really clean, light, flowing texture! And I love the antiseptic herbal extracts (ylang, ylang, thyme, horsetail, oregano) included in this shampoo great for irritated, itchy or flaky scalps. Overall: I really like this shampoo! I would recommend using it as a shampoo + conditioner duo since it’s very hydrating (unless you have very dry, damaged hair). I think it would work well for most hair types, except very fine hair. The only drawback is that I used up the 2oz $12 bottle after 3-4 washes – it goes quick. How to use it: Wet hair, use a small amount as a pre-wash, rinse. Follow with your usual amount of shampoo and work into a lather. This helps to get a lather going. Review: I recommend this shampoo a lot for people dealing with hair thinning/hair loss from long-term use of traditional shampoos full of harsh, damaging sulfates and parabens. This shampoo is great for strengthening damaged hair follicles. The drawbacks: it doesn’t lather well, the smell is off-putting to some (I eventually got used to it), and because it’s hard to get a foam going, it’s easy to go through this product quite fast. Overall: After I was able to strengthen my hair and rebound from hair loss, I stopped using this shampoo regularly and switched to other nontoxic shampoos that offer a better foaming experience and feel. I think this is a great shampoo to use if you are dealing with hair thinning due to weakened strands. But if you aren’t, I would recommend opting for one of the other nontoxic shampoos I recommend here for a better product experience. What it is: A hydrating shampoo with a blend of rich oils (argan, tamanu, jojoba) and antiseptic essential oils (clary sage, orange peel, lavender) to cleanse the scalp. Review: This shampoo reminds me a lot of the Gloss Moderne shampoo. They both utilize coconut derivatives and have a rich, creamy lather. I personally, have very straight hair that’s relatively healthy since I don’t color, perm or blow-dry my hair. Therefore, the coconut ingredients, shea butter and rich blend of hydrating oils in this shampoo are almost too hydrating for my hair. My hair feels good after using this product, but slightly weighed down by the moisture. Overall: I think this shampoo would be great for dry hair, those who frequently color/treat their hair, and/or those who use heat styling tools regularly as the added moisture will help protect the hair. What it is: A basic nontoxic shampoo (no herbal extracts) with light hydrating properties (rose water, squalene) that comes in a convenient 3.4oz size perfect for travel! Review: I am in LOVE with this nontoxic shampoo! Though it’s very basic and doesn’t offer the scalp benefitting ingredients that some of the other shampoos reviewed in this blog post do, it offers an intense foam and thorough clean feeling similar to what you would get from traditional shampoos. This green shampoo utilizes sodium laurylglucosides hydroxypropylsulfonate (a sugar derived surfactant) that is nontoxic, super gentle, provides a beautiful lather and gives hair a squeaky clean feeling I thought was unattainable with nontoxic shampoos – but obviously not! The Mother Dirt Shampoo doesn’t contain coconut oil derivatives like other shampoos (which can be very rich and moisturizing – and sometimes feel heavy), so I recommend this product for thin, fine hair as it won’t weight it down. Or for people, such as myself, with generally healthy, straight hair (do not color or use heat styling tools) and find deeply hydrating shampoos to feel slightly heavy. Overall: I really LOVE this product and how weightless my hair feels after using it. The bottle is rather small, but since it lathers so easily, you won’t need a lot and it will last about 2 weeks depending on how frequently you wash. It’s also great for frequent travelers! **PS. I HIGHLY recommend always bringing nontoxic shampoo with you when you travel. I made the mistake of forgetting mine once and ended up having to use hotel shampoo which contained sulfates and parabens. The consequences: A week later all of the baby hair growth near my hairline fell out! What it is: A charcoal shampoo with vegetable-derived micro-exfoliators meant to remove product build-up and detox the scalp and hair. Review: I have mixed feelings about this shampoo. Pros: This shampoo creates a really rich lather and I love the tingly scalp feeling from the peppermint and tea tree oil. It also cleans the hair really well! Cons: It’s in a jar container, so it’s easy to scoop out more product than you need and I couldn’t feel the micro-granules on my scalp – aka I’m not sure they really do much. Plus, it’s rather expensive. Overall: If you wash your hair infrequently and use daily styling products like dry shampoo, I think this shampoo would work well for your needs as your main shampoo. This product is marketed as a “detox” treatment shampoo for deep cleansing, but I feel it cleaned my hair only slightly better than the other shampoos listed here. Therefore, I think it makes a great main shampoo for those with product build up who wash 1-2x a week, not a detoxing shampoo to use in addition to your regular shampoo. What it is: A non-foaming green shampoo + conditioner duo. It’s made with very rich, thick hydrating elements (avocado oil, shea butter, soybean oil) and beautiful smelling citrus oils (grapefruit, orange peel, tangerine peel) great for the scalp. How to use it: Directions say to use 1-2 pumps. I have very long hair and found I needed 2-4 pumps to adequately work the product throughout my hair. Review: Because of the lotion-y texture, it’s difficult to tell if you’ve worked the product evenly throughout the hair and if you’ve rinsed it all out. Due to this, the first few times I used this product, I wasn’t able to rinse all of it out. My hair felt weighted, coated and overly moist. When I scaled back to 1-2 pumps, my hair didn’t feel as weighted, but I’m not sure it was enough to actually clean all of my hair. Overall: I think this product would be best for someone who washes frequently (i.e. first thing in the morning and later in the day after the gym) and is concerned with the frequent washing drying out their hair. What it is: A multi-purpose shampoo that can be used as a face and body wash.
How to use it: Lather, rinse. Apply to face and body. Review: This shampoo is a multi-purpose wash for hair, body and face. Now, the ingredients look clean and great, but I do wonder if the foaming surfactants (while nontoxic and safe) have the potential to dry out the skin on the face if you have sensitive or dehydrated skin. That’s my only concern. The willow bark extract and citrus ingredients (pomegranate, bergamot and grapefruit) are great additions for keeping the scalp healthy and brightening the skin. Overall: I think this is a good basic shampoo and would be perfect for someone who is low-maintenance and doesn’t want to fuss with a lot of products. Review: Similar to the Innersense Hydrating Hair Bath Shampoo, this shampoo by Graydon also contains coconut and corn derived surfactants and rich hydrating elements: jojoba, oleic acids, coconut derived fatty acids, and cocoa seed butter. It creates a beautiful, rich lather and gives a tingly scalp feeling from the peppermint extract. Overall: This green shampoo is really nice and I think would be great for someone who has dry hair since the blend of oils and fatty acids will deposit moisture to strands. I personally, found it to be too hydrating for my hair and instead preferred the Mother Dirt, but like I mentioned with the Innersense shampoo – if you color, treat, heat style your hair, this is a great shampoo option for you! *Struggling with hairloss or hair thinning? Read this blog post. Or my interview with hair loss expert Lucinda Ellery here.